When the first true dual core CPU's made their way to the market geeks everywhere were in awe. Follow that by the Quad cores that had most of us geeks salivating and you come to today where we have hexa core, yes that's six cores of CPU goodness packed into one chip. 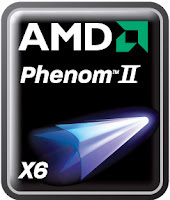 AMD today made official the new AMD Phenom II X6 processors featuring AMD's new Turbo CORE technology. Looking to take hexa core chips main stream AMD is offering you its flagship top end model Phenom II X6 1090T running at 3.2GHz at a very reasonable $285. Users wanting an even more affordable option can go with the Phenom II X6 1055T running at 2.8GHz priced at $199. Both chips feature 3MB of L2 cache, 6MB of L3 cache, and a relatively low Thermal Design Power (TDP) of only 125W and whats even better the AMD Phenom II X6 processors will work with almost all of the existing AM3 and AM2+ socket motherboards with proper BIOS support, and will function with DDR2 or DDR3 RAM making these processors an easy upgrade. AMD promises that several more six-core variants will be introduced over the next few months. The Phenom II X6 1035T running at 2.6GHz will launch later this quarter, while the Phenom II X6 1075T running at 3.0GHz will launch next quarter. The Phenom II X4 960T, a 3.0GHz quad-core Thuban chip with two cores disabled will launch later this quarter as well. Given this relatively ow price users might wonder how the chips stack up especially considering Intel's new high end Core i7 980X 6-core chip tips the scale at $999. Well so far the reviews look great. Anyone who already owns an AM2+/AM3 system and is looking for improved multi-threaded performance would be foolish not to consider jumping on the Phenom II X6 bandwagon. The only down side I see is that in many of the reviews these chips were out performed by slightly older Intel Core i7 chips. Tom's Hardware had a great two part write-up awhile back entitled How Many CPU Cores Do You Need? (part 1 | part 2). In the write-up they explored the differences between dual, triple and core quad core chips. Raising the questions how many cores is good enough for the average user? A few years ago before many programs, games and other apps were written to be multi-core aware a dual core setup would be sufficient for most users. Even today the average net surfer still won't see much improvement from adding a quad core chip to their system. But most users are becoming more technically proficient and are running more apps that show thread-level optimization and can fully utilize the additional cores. Does this mean that we should all dump our quad core chips for hexa cores. No not at all. Yes there are users out there that can and will benefit from the additional CPU power but that doesn't mean those users are you. These people are doing video encoding, 3D rendering, and using highly optimized productivity titles. They aren't your average everyday user. If you are running a rig with a decent quad core CPU now then there is not enough of a performance increase to warrant and upgrade. If however you are running an AM2/AM3 rig with an older dual core and you are wanting to add more cores then you'd be silly not to look at the hexa core chips. Today is iPad Day, Did You Run Out And Buy Yours?